If you missed the Luminaria Ceremony at 2018 Shorecrest Relay For Life and the gathering of students and friends on Haskell Field as the Pentatonix version of "Hallelujah" was softly playing over the PA system, you missed one of the most spiritual moments many of us have ever witnessed at a school event. Moments earlier, Evan Stypinski ‘18 read a tribute to his mother, Monica, and members of the Relay Steering Committee explained the importance and meaning of the Luminaria Ceremony. Following the talks, all in attendance walked a lap around the luminaria-lit track and without prompting gathered on the field. The music broke the silence while students and friends embraced each other and the Stypinskis. 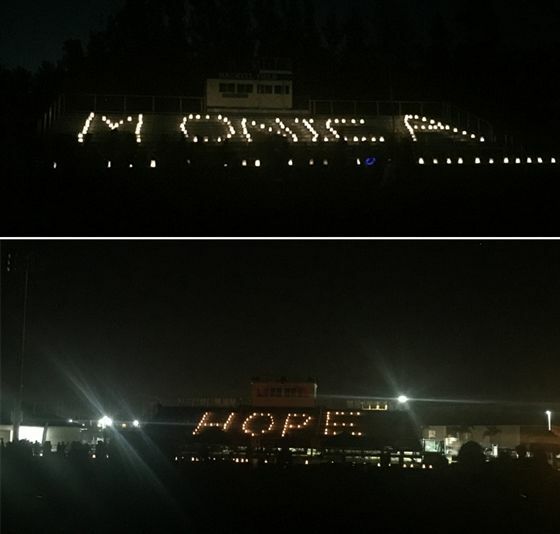 The words “Monica” and “Hope” were spelled out in glowing candlelight from luminaria bags placed on the home and visitor bleachers. Shorecrest is a rare environment in Tampa Bay. Yes, we have our Five Core Values, Yes, we have an Honor Code. Yes, we are one of three independent schools in the region that does not have a specific religious affiliation. I am sure I am not alone when I note that for those of us who attend churches, synagogues and mosques, few have seen such a beautifully spiritual moment as the one that played out on Friday evening during and following the Luminaria Ceremony. Relay gives us Hope for cures for cancer to be developed. On Friday, our students, their families and friends gave me hope in the future of mankind. I have never felt closer to Shorecrest and proud to be a Charger than during those moments on our field. No victory, no award, no other achievement exceeded the beauty and joy we witnessed and shared. Lexi Klein '18, Olivia Olson '19 and Jordan Trailins '19 - our 2018 Relay For Life co-Chairs - their families, their Steering Committee members, Jessica Sheets from American Cancer Society, and the faculty and staff from Shorecrest who worked on Relay organized and executed a meaningful program and event. Cheers to all of them. Read a recap of Relay For Life 2018 with a video and photos here.